Greetings friends! I hope that you are enjoying and making the most out of this fun, festive, and frantic time of year. I am packing up the car today, in preparation for my 6 hour trek up north tomorrow. Not looking forward to the drive, but looking forward to the time with friends and family. 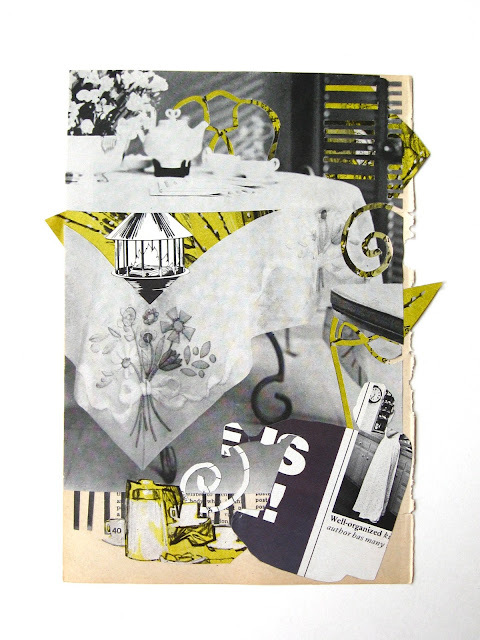 The eye-catching collage that you see here was created by my artist pal Kari McDonald. She has challenged herself to make a collage a day for a year. 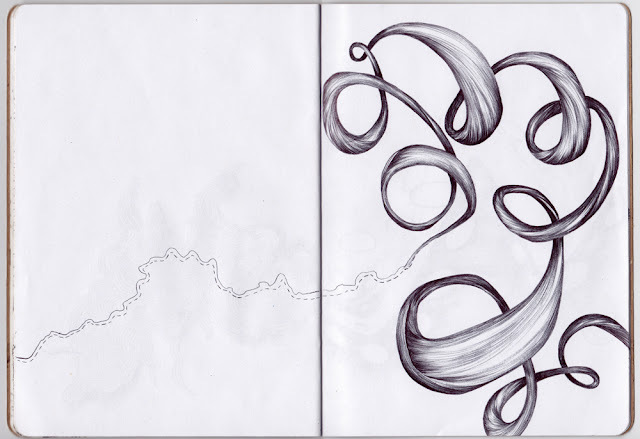 I'm humbled that Kari took her inspiration for this this piece from my own work! I love the little pops of yellow amongst the neutral palette and her crazy good paper cutting. Look at those chair legs and back. Some mighty fine exacto work! Did you notice the text in the bottom right corner? She uses lots of vintage ephemera like this in her work. 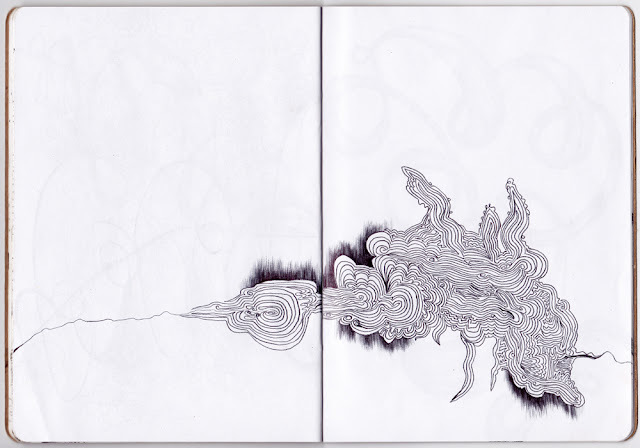 Sometime in 2012, Kari will be exhibiting her 365 collages all together. I can't wait to see this momentous show! 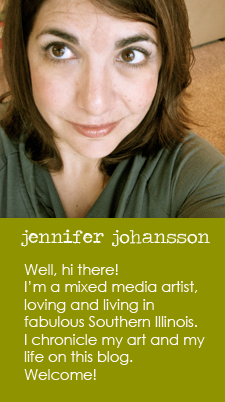 "Jen's Coffee Window" and Kari's other collages can be seen on her blog and flickr page. She also sells her fun repurposed vintage button jewelry and accessories at The Paper Button and her handmade etchings, lithographs and screen prints at The Paper Button Press on Etsy. Please patronize my talented friend! 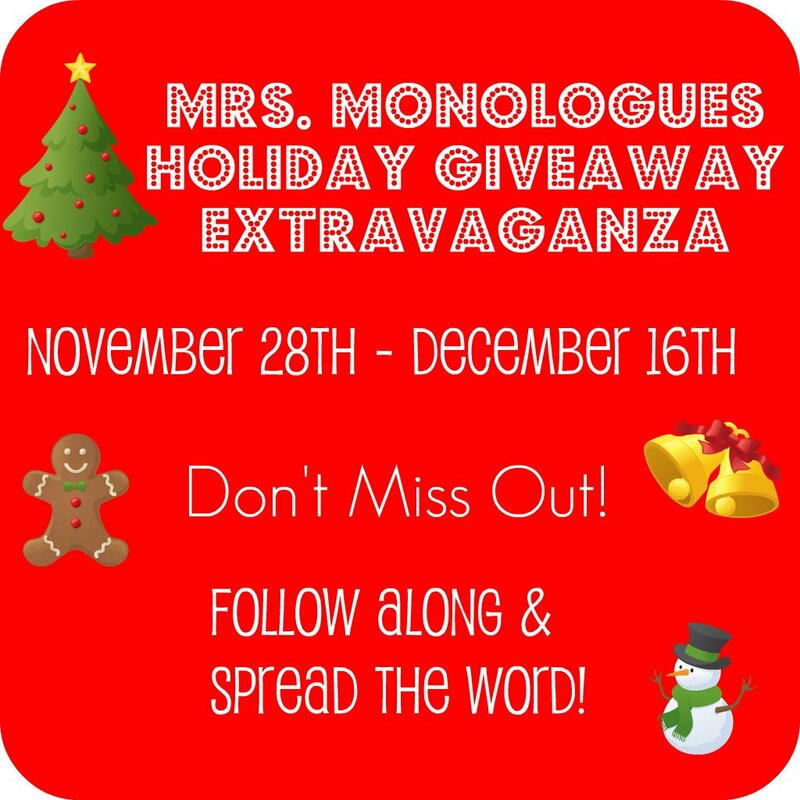 Don't forget to enter my giveaway over on the Mrs. Monologues blog! Last day to enter is Tuesday, December 20th. Greetings Friends! It's all Christmas at the Johansson house right now. I leave to go up to Rockford for the holidays on Tuesday, so I'm getting all of my gift buying, making and wrapping completed this week. 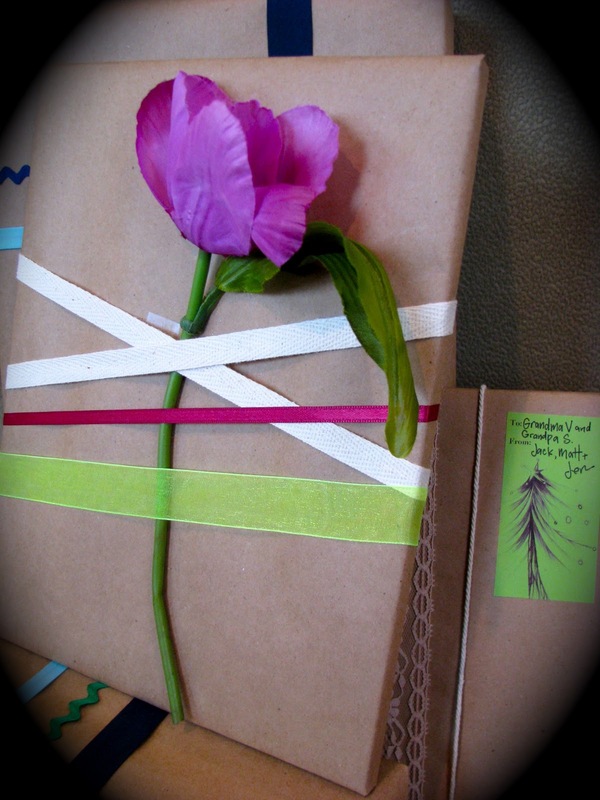 I have always enjoyed wrapping presents and aspire to make each one a little work of art. I also try to be somewhat "green" about my wrapping, reusing and re-purposing papers and ribbons from year to year. All my relatives know to hand the salvageable ribbons/bows over to me when we are opening presents. This year a spent a whopping $4.25 on wrapping supplies. $4.00 went to a roll of brown craft paper. This is my go-to wrapping paper and I really don't use anything else. I like its earthy, neutral tone and by changing out the ribbon, I can make it work for any occasion. The remaining $0.25 went to a bag of vintage sewing notions that I picked up at a thrift store a while back. There was lace, rick-rack, and seam binding in a variety of colors and all in its original packaging. Score! I'm not all that big into bows, so I tend to wrap the ribbons around the packages to create stripes. 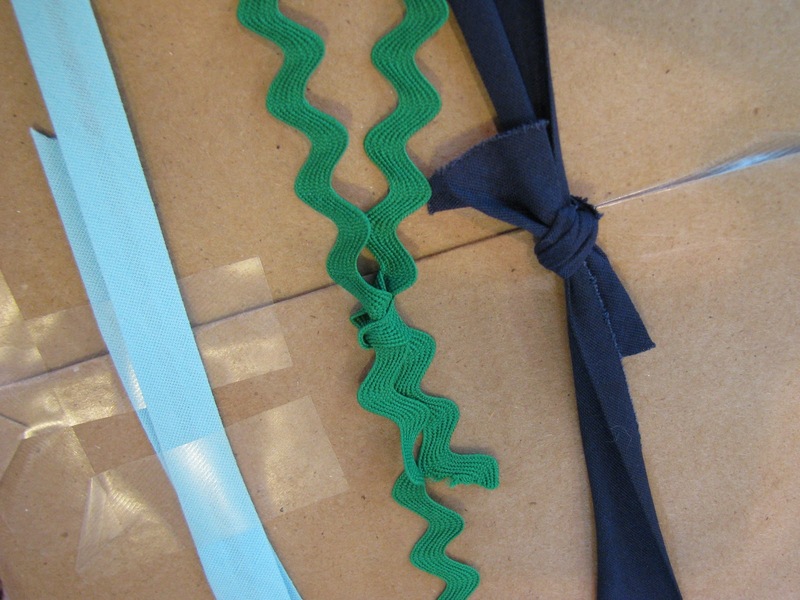 I then tie or tape the ribbons on the underside of the packages. It's not all that pretty on the back side, but it's the front that matters anyways right? This is my mom's birthday gift. (Her birthday is December 19th.) I just taped on the fake flower that I found in my trusty wrapping materials box, added some criss-crossed ribbon in complementary colors (also from my box) and voila! I used a Crown Royal bag to wrap up this gift. I've got a small arsenal of these and have re-used them several times in a variety of manners. They are great for a rolled up t-shirt, jewelry, lotions, candles, etc. 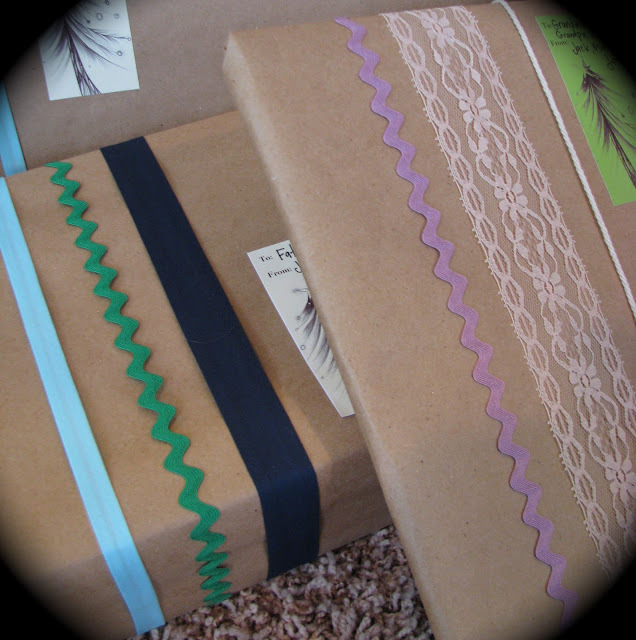 How did/are you going to wrap up your holiday gifts this year? I'd love to see what you did. Feel free to leave me a link in the comments so I can check it out! Happy Holidays folks! Ta-ta for now. 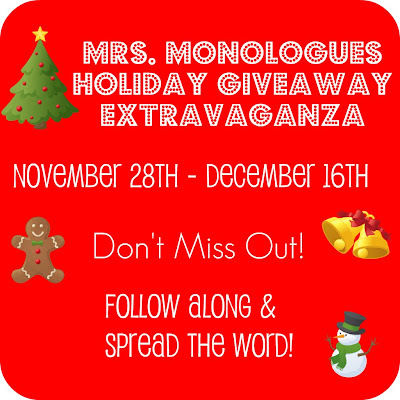 I'm hosting a giveaway over at the Mrs. Monologues blog. You can win a Sitting Serenity Card Set, Glitzy Gift Tags, and a 5x7 floral print. Woo! Run right over and enter! I've done quite a bit of drawing in the past few weeks and have several new pages completed in my 2012"Sketchbook Project" sketchbook. 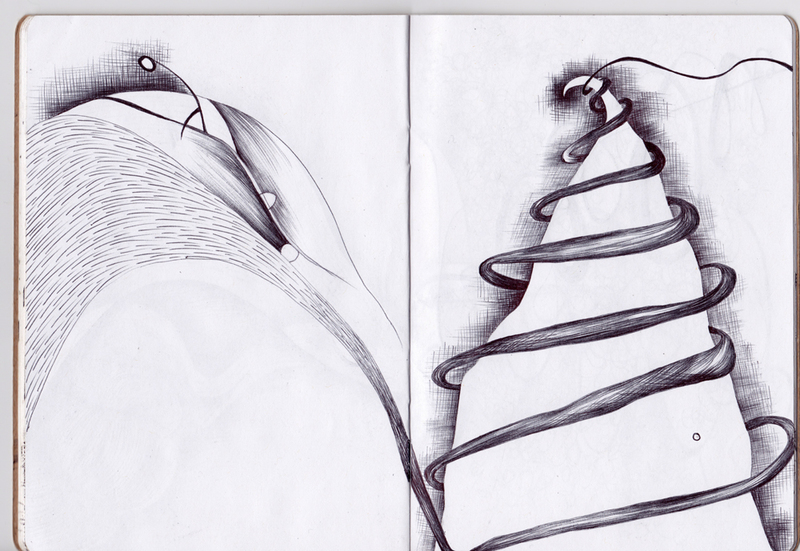 This one was inspired by an NPR story about designing a hiking trail with switchbacks. Only a few pages left and then I'll be ready to send it off to the Brooklyn Art Library and the Sketchbook Project tour! 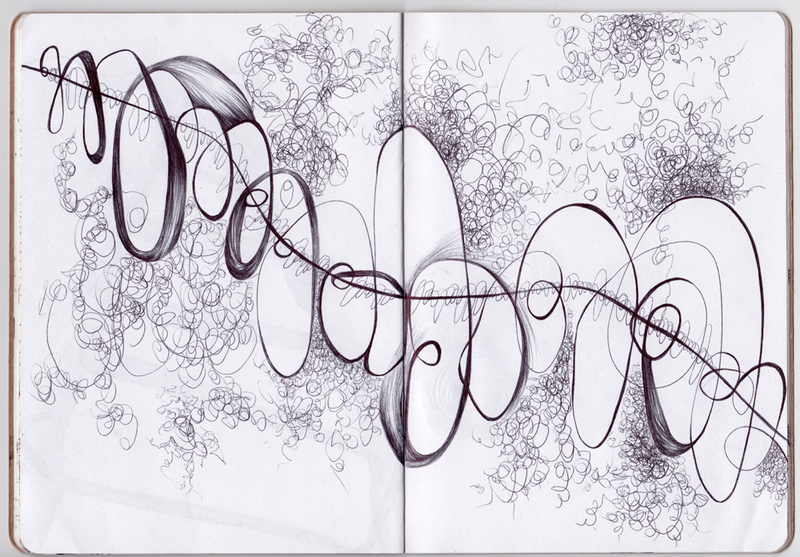 See my whole sketchbook on my Flickr page. In other news, I've been so busy that I never got around to taking my Etsy shoppe off of "Black Friday" sale mode, so you're in luck! I've decided to continue shipping anything in my shoppe for FREE until December 19th. Wa-hoo! Go shop!